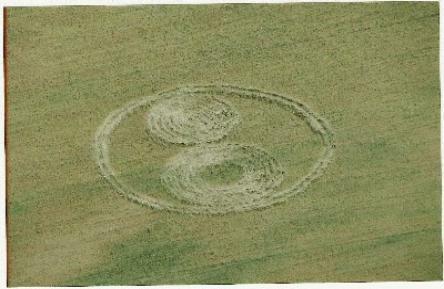 "So who's behind the 8 Ball Now "
Aerial Shot of the Crop Circle - Nice Try Guys , but No Cigar! truth. We were hoping for cherries but only got the pits on this one. to say today no one laughed. bunt of practical jokes . than did the authenticity of their crop circle. please make sure to check out the photos and watch the video clips. Thank You. 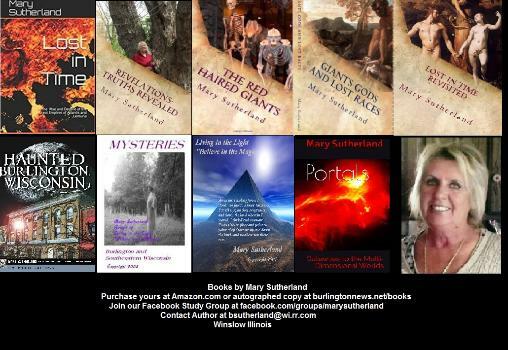 Mary Sutherland BUFO Paranormal and UFO Investigations. behind by the hoaxer . Although a full story will be up on this site next week. circle clearly shows us that this was made by human hands. forward when it is so much easier to just call it quits. According to Jeff Wilson, Director of the Independent Crop Circle Researchers Association one in every five crop circles are hoaxes. delight in them that it seems they don't mind one way or another - Its great entertainment to pack up the family and take a trip to the country to view one of these circles - and its Free! should also be considered trespassing and destruction of property. pattern - Not only spiritually, but emotionally and physically. you stagnating, just like a stagnate pond. And since when is a stagnate pond healthier than a fresh running stream??? disinformationists. If we stop our work to defend each and every action we take, we no longer can go forward - thus missing out on some great opportunities still yet to be discovered. the starting line. I like for them to feel they are part of what we are doing. Then it is there choice to respond or not. I consider us lucky that the team of the Independent Crop Circle Researchers Association responded to our request for help on this. 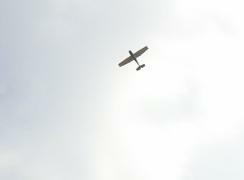 We then went airbone, visually observing and photographing the formaton from about 2,000 feet above. 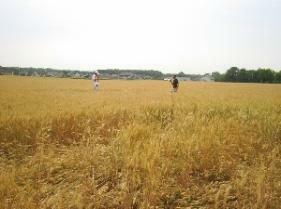 Although the team had not gone into the field yet, it didn't look good for an authentic crop circle. Once we got inside the circle, we noticed that the stocks pointed to or layed over objects such as rocks. If it had been authentic the stocks would have fallen or flowed over these objects. Instead of falling or flowing around standing objects, such as rocks, all the stocks pointed to or lay over the objects. "You got a serrated edge here, Roger," Wilson yelled to Roger Sugden as he moved on to the outside of the circle. "As you push stuff down with a board, the wheat goes flat in one direction, so when you try to make a turn, you end up with an edge that's saw-toothed or serrated,"
levels of electromagnetic, microwave and radio emissions. 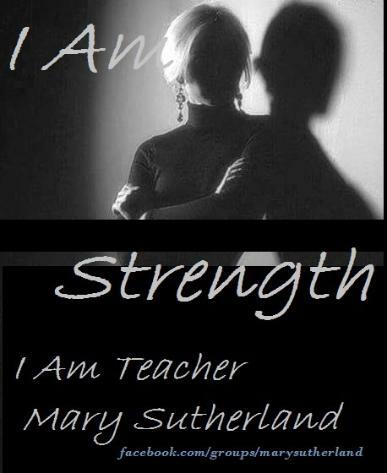 investigator and a teacher in the Detroit public school system. ICCRA investigator Delsey Knoechelman found several small pole holes within the circle, pointing out they used string to get the measurements and pattern more precise. photos, and watch the videos, you will now have a better understanding of Crop Circles - the People that research them and those that try to manipulate your thinking through the Hoaxed Circle. . Remember, there is a difference - the fake can only mimick in shape and patterns. 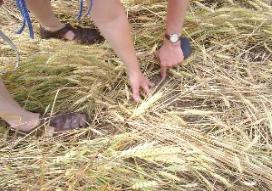 It can not leave the tell tale signs of the authentic crop circle. And this is what the research teams such as ICCRA looks for - EVIDENCE - Without that - it is only art. that we will find TRUTH. My special thanks to RJC's Janine Anderson and Tom Barton for being such great sports,and enduring the hot sun right along with us. THE MYSTERY CONTINUES - WHO HOAXED THE CIRCLE - MONSTER GARAGE???? This came out in the Journal times just before the show aired - to give you an idea what we were all thinking here. Nothing could be said by us on this end until after the show aired, according to Brad's contract with them. 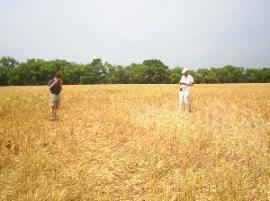 Burlington - In late June, a crop circle showed up outside Trevor, minutes away from Burlington. a machine that could make one of the mystical formations. The episode airs at 8 p.m. Monday. The show found the Sutherlands through the Couple's website. http://www.burlingtonnews.net and asked Brad Sutherland if he'd be interested in working with them on the episode. Paco Medoza, executive producer of the episode, said the team was put together to include people who believed in the paranormal aspects of the farm field formations and those who didn't. "We wanted people on both sides of the aisle. ", he said. 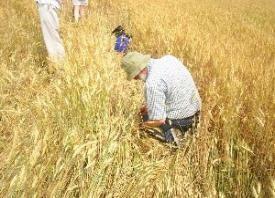 "Crop circle believers and skeptics". Sutherland said he had a great time, even though some of the people thre didn't share his beliefs about aliens and UFOs. "I loved it", he said. One of the skeptics, Sutherland said, was Jesse James, who married actress Sandra Bullock in July. "He don't believe," he said. "He made fun of it the whole time we were building. It made me feel bad for Travis Walton. It had to bring back some bad memories." Waltons abduction story was turned into the movie "Fire in the Sky." meticulous they were in constructing the machine, Sutherland said there was no way it would make a circle that could confuond the experts. 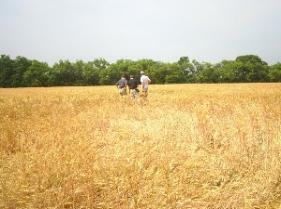 Unexplainable crop circles have a few tell-tale signs, Sutherland said. The nodes of the plants are often misshapen, and traces of radiation show up in the cirlce. diappointing, researchers don't always mind that they appear. Sutherland and the people at "Monster Garage" have their theories. "The timing was too convenient for it to be real," Mendoza said. "He was on "Monster Garage' and over thre his wife was finding crop circles." having it that close and me being out there building what we were building". would play out in the upcoming show. As you see, the end was a complete flop. Something happened to cause the show to fizzle out in the end. Could it be that the ending they planned on never played out as planned? Sorry guys - It wasn't us left holding the eight ball on this one! MONSTER GARAGE SHOW AND BRAD SUTHERLAND - WHAT HAPPENED TO THE ENDING??? E. "I'm hearing that there were reasons why they just blew it up - I saw it work so they should not have blown it up. Can't wait to find out why!" Mary: Yes, the machine the guys made ran - but big difference between running and being able to duplicate a ufo crop circle. I was impressed with Jesse James stating that he believed that Travis was abducted. Thus he in respect stated that ufos would thus have to exist. don't know - I just turned the TV off once they started to torch all that hard work. Sounds like a continuity problem with the production company. Wouldn't have been so bad if we hadn't made it the centerpiece of our halloween party - "we're going to watch this great show!". Hmpf. Thanks anyway. Mary: bummer. sorry about the halloween party. Brad thinks that Jesse tried to get it to make the crop circle and it didn't work. He said that Jesse 'hates' failures. So in most likelihood he got 'pissed' and blew the thing up. But here is my "theory" - for what it is worth. 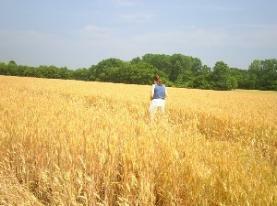 saying he lived across from where this crop circle appeared contacted 'me' and reported it. Brad's response to the circle on television. Which I did. Fortunately for me, the day before all this transpired, I had called in some of the crop circle researchers and Nancy Talbot. 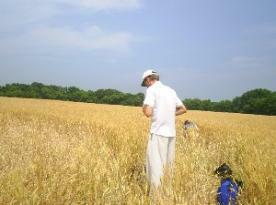 The crop circle researchers came out and met me at the crop circle. We were able to prove that the crop circle was a hoax and I made my announcement as such. They had even designed the darn thing as an eight ball! I then posted it on the site, calling it a hoax and jumping on whoever it was that wasted our time in over 100 degrees heat. I think what happened is that they tried to make a joke out of us ufologist and crop circle researchers, using me as the sacrificial lamb. It would have made a great show for them if I had fallen for the gag and announced to Monster Garage that it was real. I think that Jesse and those guys was left with egg on their face as the joke backfired on them. Jesse didn't like it and blew the darn thing up. the story of Monster Garage and the Crop Circle in Trevor. I may be wrong - but there sure were a lot of coincidences going on at that time...too many. However - just like the ufos - it is my story and I need the proof - and we know that Jesse and those guys are never going to admit to this. and successful post-build test in the dead grass' and send the rest of the show into the trash compactor of the sun to have the wasted energy liberated back into the universe (blow it up! was a failure, so you can see why they got pissed and just blew the machine up. I am sure they would have liked to have the producer tied to the steering wheel of the tractor.